By 5 p.m. it was still hard to tell which way the match would swing. The hot, muggy afternoon seemed to drown our cheers, and our opponents’ insistent drumbeats showed no sign of stopping. On the pitch, the girls were clearly exhausted, with lost leads and ineffectual attacks from both teams. On 2nd May, a small band of us was in the stands at Serangoon Junior College, urging on the Raffles girls’ soccer team in their semifinals against Millenia Institute. Joining our motley crew – of classmates, juniors and the boys’ soccer team – were a number of alumni and curious onlookers who’d elected to cheer on our side. It was already the second half, and our hoarsening voices were little match for the cheers from the ranks of blue uniforms on the other half of the stadium. The match didn’t seem to be particularly in our favour, and, if not for the dogged verve of the soccer girls (and the cheerful optimism of fresh supporters who trickled in to join us), many would have lost heart. Finally the whistle blew, and both teams congregated round their benches, spent. With the score still at nil-nil, the result of the match – and which school would move onto the final at Jalan Besar – would be decided in a penalty shootout. Relieved that the girls hadn’t conceded, but anxious to see how the next, decisive minutes would turn out, the supporters linked arms on the stands, as did the junior team, alumni and reserve players on the pitch. The stadium, ringing with encouragement from both sides, fell into a hush. First kick from Millenia – saved. First kick from Raffles – a goal. The team and their supporters broke into cheers. Second kick from Millenia – not saved. The other half of the stadium erupted, and both teams were even now. Second kick from Raffles – saved. Third kick from Millenia – not saved. Third kick from Raffles – missed. Fourth kick from Millenia – missed. Fourth kick from Raffles – missed again. We waited with bated breath. – and we did. The reality of what had just happened didn’t hit us as we cavorted on the stadium steps, nor as we ran across the pitch through the hastening drizzle to congratulate the team. Not even as, jumping and crying, they ran to shake the hands of the MI team, and the results were announced over the speakers. 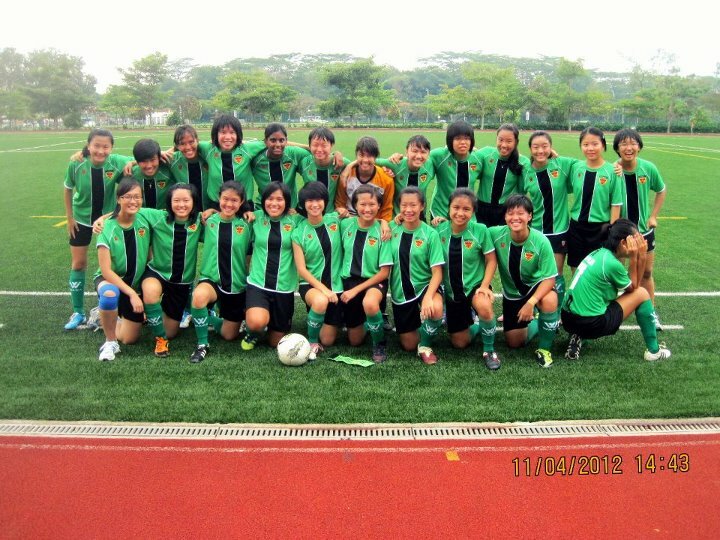 But it was official: for only the second time in the team’s history, and with absolutely no experience in the C- or B-division, the Raffles soccer girls were through to the finals. As Cheng Lynn posted later that evening on the ‘RJC Batch of 2012’ Facebook group, they had certainly “defied the odds”. The girls will be playing their finals at Jalan Besar Stadium next Tuesday, 8th May, at 5pm.